While the whole world is still paying tribute to Michael Jackson and while media is still cashing on the death of the King of Pop, here is a guy who has put up on sale an energy drink endorsed by Michael Jackson. 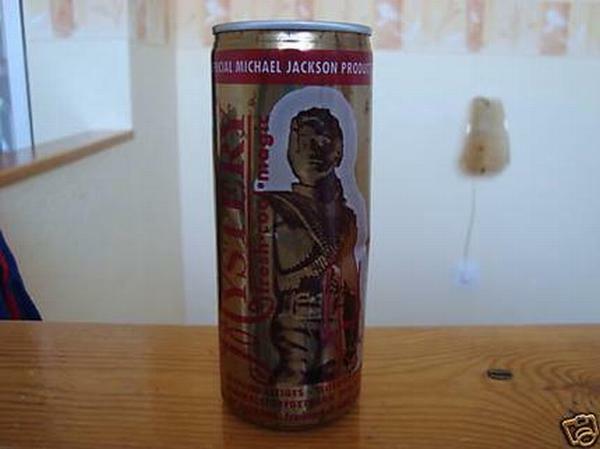 This energy drink is one of the few ever to be put up on sale and now that Michael Jackson passed away, this Michael Jackson energy drink has been known to even have a dedicated fan site. In fact, Michael had a hand to play in the contents of the drink and he made sure the drink had nothing artificial in it. It contains 1.7 % juice and many fruit extracts along with Magnesium Carbonate, Guarana Extract, Caffeine and Flavouring. The energy drink also comes with a number of vitamins like Vitamin C, Niacin, Pantothenic Acid, Vitamin B6, Thiamine (VIT B1), and even other nutrients like magnesium. Beosal, the owner of the energy drink has kept it unopened for about 11 years and has quoted a price of $50,000. The mystery MJ energy drink will certainly attract the attention of many people and this again shows how people cash in on celebrities deaths. MJ certainly deserved a better deal.